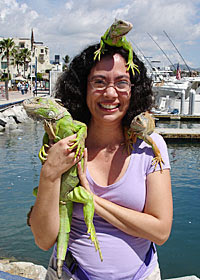 La Bloga: An interview with Christianne Meneses Jacobs, editor of Revista Iguana. An interview with Christianne Meneses Jacobs, editor of Revista Iguana. What is the story behind your publication, Iguana magazine? My husband and I created Iguana because we are raising our daughters in a bilingual environment. We searched, but could not find quality literature originally written in Spanish. 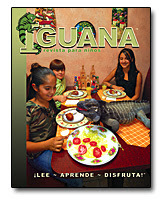 Our desire to read in Spanish to our oldest daughter, who was three years old at the time, inspired us to start Iguana. We researched the idea for about a year and discovered that there is no other Spanish language magazine for children published in the United Sates. We were encouraged by the positive responses to the idea by librarians and teachers. What’s your magazine’s mission? Who is your audience? 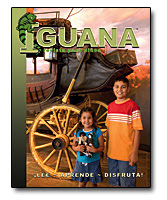 The mission of Iguana is to serve as a tool for Spanish language retention and Latino cultural preservation. Our primary audience is Latino families with children who are growing up learning Spanish. Additionally, schools with dual language programs, bilingual families, libraries and Anglo families who want their children to learn Spanish, as recommended by their teachers. Why the name “Iguana”? Is the iguana on some of the covers a real one? Many of the children magazines in English have names of animals. We thought it was a good idea to use a word that can be spelled the same way both in English and Spanish. Besides, I grew up in a tropical country, Nicaragua, where every day at noon all the iguanas living in our backyard would come out to take sun baths. The iguana that appears on some of the covers is T-Bo and he is a real iguana. T-Bo is a 16 year old rhinoceros iguana owned by Reptiles Adventures here in the Phoenix area. T-Bo is very professional and is always a joy to work with. Tell us more about yourself, your background and how do you handle bilingualism at home. I grew up in Nicaragua and came to the United States when I was 17 years old. I went to Wesleyan University in Connecticut and earned a degree in Government. I returned to California after graduation and then began my career as an elementary school teacher. I was a bilingual teacher for several years in Los Angeles before the program was eliminated by a state wide proposition. I moved with my family to Arizona five years ago. I have a Masters’ Degree in Education and a Reading Specialist Certification. I am currently a first grade teacher in one of the lowest socio-economic areas of Phoenix. Unfortunately, I did not have the opportunity to grow up bilingual. I did, however, study English from the time I was nine years old. Now I am married to an Anglo and have two daughters, Isabelle Selene, 5 and Katherine Celeste, 21 months. My husband and I decided before Isabelle was born that he would speak English and I would speak Spanish. Both of our girls understand everything we tell them in either language. Katherine is not talking yet, but Isabelle needs to be reminded to switch languages. She feels more comfortable speaking in English. It can be a challenge to get her to speak in Spanish. We are considering spending next summer vacationing in Nicaragua to immersed the girls and my husband in the Spanish language and Latino culture. Your magazine is wonderfully creative and very attractive with its high variety of content – you present not only factual, historical and even scientific tidbits of information, but also cartoons, short stories and poems. Where do you get your ideas? Who inspires you? Iguana wants to introduce children to a wide variety of topics that schools either glance over or do not cover due to lack of time. As an educator I am knowledgeable of school curriculum. Our students are only taught the basics in schools while general culture is neglected. An educated person has knowledge about a variety of topics and can sustain an intelligent conversation with anyone. We try to encourage our readers to know more. Therefore, Iguana contains various sections such as Inventions that Changed the World, Mythology, Children Around the World (with history and geography) and a feature on exotic animals, recipes, arts and crafts and comic strips. One of my favorite features is the interview section in which I select a successful Latino/a who can be a role model for Latino children. I highlight their beginnings and their accomplishments. The goal is to show Latino children that Latinos can be successful and contribute their talents to society. Who writes and illustrates for you? How do you collaborate? Iguana has a core group of approximately 30 writers and 35 illustrators who live throughout the United States and around the world. Our writers must be native Spanish speakers who can write in Spanish and are familiar with all the intricacies of the language. I have writers who only write fiction pieces, and writers who contribute both fiction and non-fiction. Our illustrators do not have to be native speakers. There is more flexibility in that respect. We are very fortunate to live in the Internet era since a large portion of our job is done through email and the Internet. 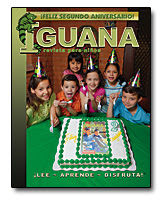 As the Editor of Iguana I plan the editorial calendar for our six issues and brainstorm topics of interest to children. I assign articles to the writers and give feedback. I discuss illustrations with my husband, who is Iguana’s Art Director. I then communicate with the artists and assign illustrations. I maintain the deadlines and make sure everyone turns their articles in on time. I assist my husband reviewing the illustrations and requesting changes. I then communicate the changes to the artists. I also write several pieces for each issue. I handle other work involve in running the magazine. I take care of subscriptions and renewals. I send out press releases several times during the year. I constantly meet with businesses and individuals, and attend meetings related to the Latino community. I also travel to book festivals and conferences. As the publisher I keep a tight grip on the budget. I pay all of our contributors. I attend business meetings seeking financial support and sponsorship for Iguana. Additionally, I give interviews. I read newspapers and magazines to keep informed. My husband and I have more than 25 subscriptions to magazines, not including our daughters’ subscriptions. We are magazine junkies! My husband deserves credit as well. I am able to work full time as a teacher and run the magazine thanks to his unconditional love and support. He does an amazing job taking care of our daughters, designing the magazine, keeping the accounting and supporting me. What particular advice or message would you have for bilingual kids? Parents and educators? My advice to bilingual children is to continue learning more about their chosen language. Learning to speak the language is not enough, children must learn to read and write like native speakers. We are living in a global economy and parents need to help their children understand that being bilingual, or multilingual, is an asset to them. They will be able to communicate with more people around the world as well as opening the possibilities to obtain great jobs because of their language skills. I would advise parents of bilingual kids to keep trying hard everyday and do not give up on the journey toward raising bilingual children. It is difficult at times, but be persistent. Traveling with your kids to countries were the language is spoken can be a great experience. Try to expose your children to the beauty of your language and culture. I would advise educators to show respect for and support the minority language that their students speak at home. Educators need to teach other children about tolerance and acceptance of differences. The Unites States is a diverse nation and children need to start getting along with all kinds of people from they time they are small. A good post for your Wed. debut, René. I subscribe to Iguana and my 2nd graders devoured each issue. A great way to begin the new school year! Thanks for the interview and pub. info. I'll be spreading the word about this publication as best as I can.